Update Sept 15 ! Price Alert! 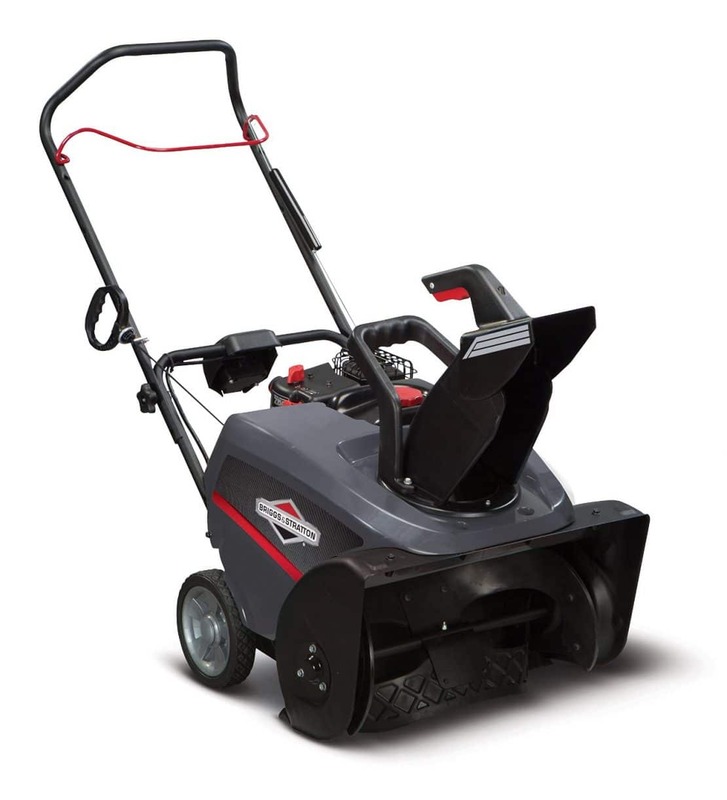 Briggs & Stratton just dropped the prices on the economy Briggs and Stratton 1696610 Dual-Stage Snow Thrower with 208cc Engine and Electric Start and the residential Briggs and Stratton 1696614 Dual-Stage Snow Thrower with 208cc Engine and Electric Start by over 25%! This makes them two of the best value 24 inch snow blowers on the market! (They do not have power steering.) At $599 and $649 respectively they are now one of the best buys in 24 inch snow blowers! Is a Briggs & Stratton Snow Blower The Best For You? You may not have known that Briggs & Stratton even makes snow blowers so I am going to give you a little history lesson before I start talking about them. Briggs & Stratton is a primary snow blower manufacturer. They make a full line of economy, residential, heavy-duty and commercial snow blowers in Wauwatosa, WI under the Snapper (Red), Simplicity (Orange), Briggs & Stratton (Gray), Murray (Red), and Brute (Black) names. In particular the heavy-duty and commercial lines have been the “standard” for many years. They are dependable and built to last. Snapper and Simplicity are primarily dealer brands. Use the dealer locator on the Snapper or Simplicity website to locate a dealer near you. Murray is primarily sold at Wal-Mart. Use the dealer locator on the Snapper or Simplicity website to locate a service center near you. The last Brute I saw was at Menards. Use the dealer locator on the Snapper or Simplicity website to locate a service center near you. Briggs & Stratton is now sold online through Amazon. Use the dealer locator on the Snapper or Simplicity website to locate a service center near you. If you don’t get a lot of snow but want a quicker way to clear you driveway than with a shovel this snow blower is a good choice. It is one of the few in this price range that comes with electric start. This snow thrower will clean right down to the pavement and handle up to 6 inches easily. 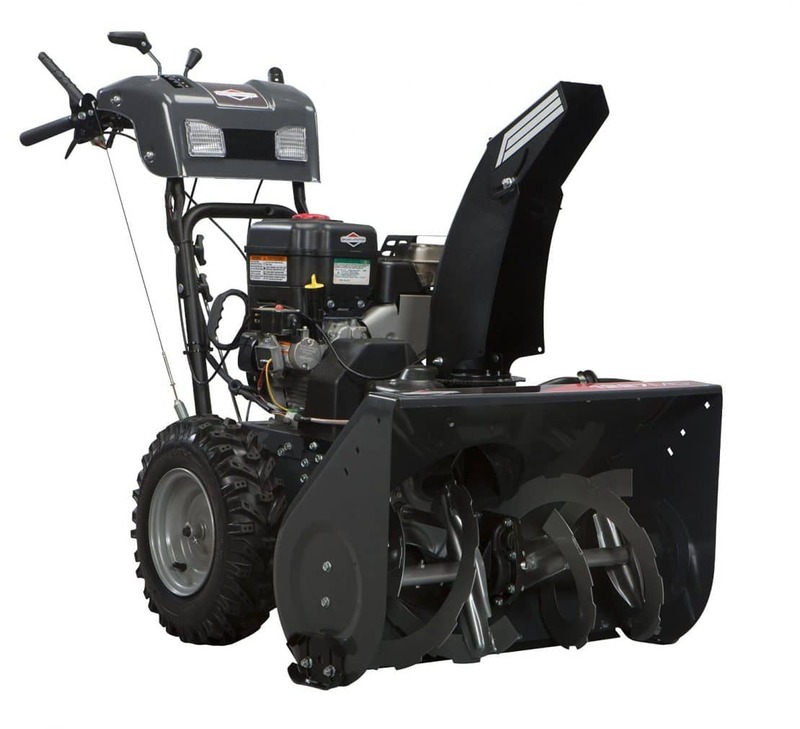 This is a standard size single stage snow thrower that will handle 6-8 inches of snow comfortably. Many of us have both a two-stage snow blower and also a single stage for the lighter snow and cleaning down to tha pavement. This snow thrower does that task extremely well with the metal/rubber serrated auger. It will cut through day old packed snow better than other single stage models. If you normally get up to 8 inches of snow and an occasional 12 incher this is a great choice. 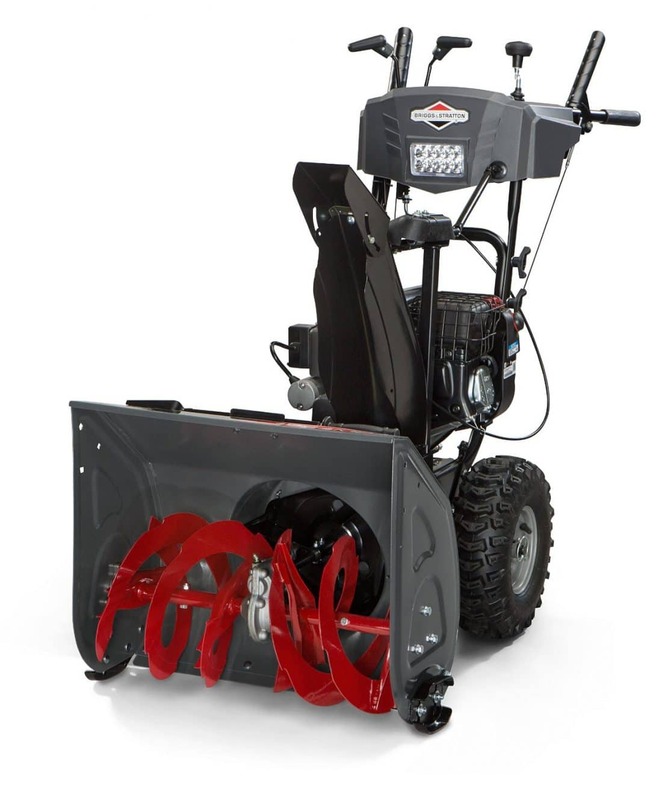 This snow thrower is one of the strongest single stage snow throwers on the market. It’s actually overpowered and will handle tough hard packed snow. It will throw snow up to 30 feet. This is a basic, inexpensive two-stage snow blower. It has plenty of power to handle the occasional 12 inch snow. For the same price as the economy model above you can get this model. It’s a stronger snow blower with more features. If you normally get about 40 inches of snow a year this is a good choice at a good price. 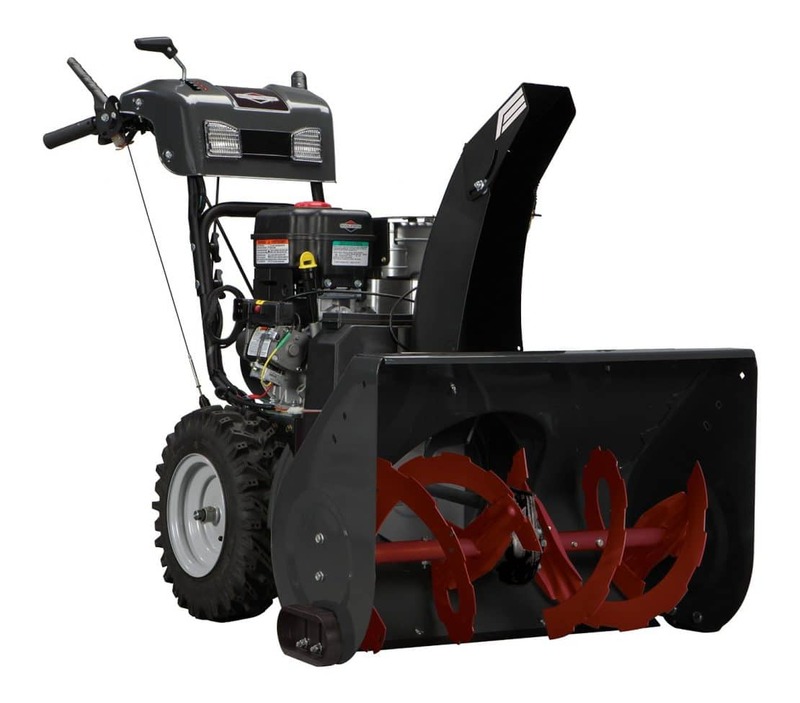 This snow blower compares to the MTD built 28 inch two-stage models. For many years this has been the standard snow blower that all the other 27-28 inch heavy-duty snow blowers were compared against. This snow blower is built well and built to last. If you are looking for it on Consumer Reports it is basically the Snapper 1695964 with power steering. Again this snow blower has been around for quite some time (It’s been painted red, black, orange and GREEN!) and has been a standard heavy-duty machine that all the others are compared against. 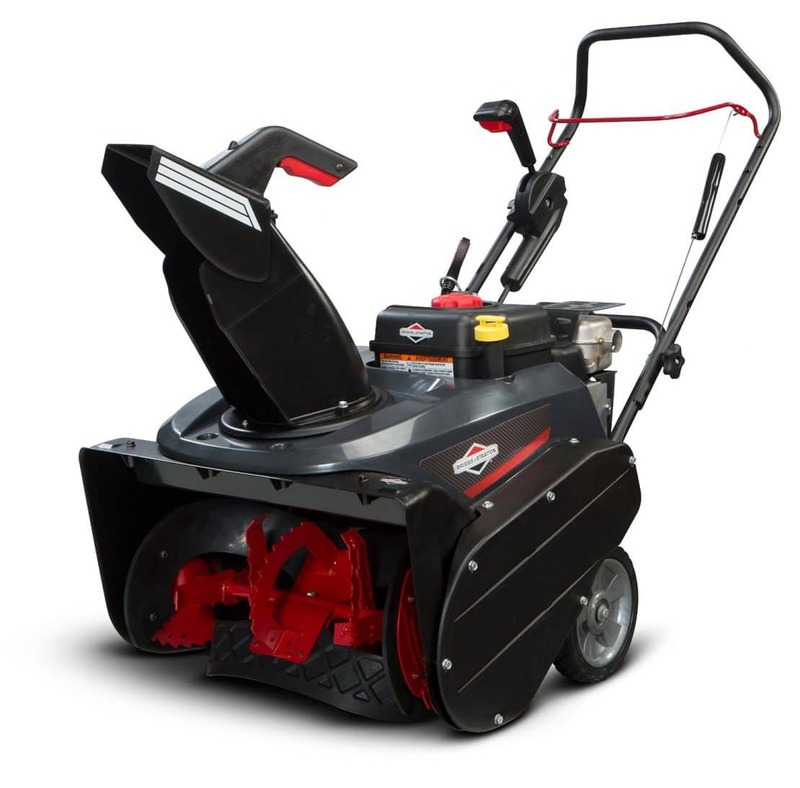 It compares favorably to the 30 inch Ariens Deluxe, Husqvarna 300 series, Craftsman Pro and Troy-Bilt Vortex for ease of use, dependability and long life. It doesn’t have 3 stages or a high speed impeller yet it will throw snow up to 45 feet. This snow blower will easily handle the snows we have been getting in the NorthEast. When you get larger than 33 inches most of the snow blowers on the market become big unwieldy tanks that are hard to handle and have poor traction. This is not one of them. If you have large areas to clear like parking lots, city-school sidewalks and very long, flat driveways this is one of the best large frame snow blowers on the market. It’s big, powerful and has a great repair history. To see all the snow blowers on Amazon that I recommend go here: Paul’s Recommended Snow Blower List Use this list to check prices compared to your local dealer or buy the snow blower you always wanted! Snowcast Shock Handle Snow Shovel | You Really Need This Snow Shovel! Thanks for your quick response. I already bought a no spill fuel container and always use Sea Foam in my outdoor equipment. I’ve yet to see any information on how to change the rubberized paddles except to take it to an authorized B&S repair facility . Hi, If you are just cleaning your own driveway the paddles should last you at least 10 years. Hey Paul, love this site.I just purchased a B&S 1150 single stage with the snow shredder auger mainly because of the driveway piles at the end of the driveway. I have a smaller driveway 16×50. After a lot of research I decided that this was the best choice.My question is about the carburetors on these. Are they really that easy to get gummed up or are these just complaints by people who use bad fuel or don’t add stabilizer? Also, are the rubber paddles secured by nuts and bolts or rivets? Hi Michael, 98% of the time engine problems with name brand snow blowers are either fuel or operator related. Snow engines run/operate differently than your lawn mower engine and because of that, I suggest educating yourself on how to store fuel, how to keep your fuel clean and how/why your snow blower engine runs the way it does. This information will go a long way toward liking your new snow blower. Please read this article to learn more: Buying A New Snow Blower FAQS – Read This For The Truth. Here are the accessories for your new snow thrower I recommend: The Best Snow Shovel, Ice Scraper and Gas Can To Compliment Your New Snow Blower. The pictures show it uses bolts. I don’t have anyone near me selling them to check a floor model. If price is the same, which one do you think is better? Briggs & Stratton 1696614 or Craftsman 88173? Trying to decide between these 2 as they’re in my price range. Hi Patrick, the Craftsman 88173 has been one of the most popular snow blowers made. It reliable and simple to use. 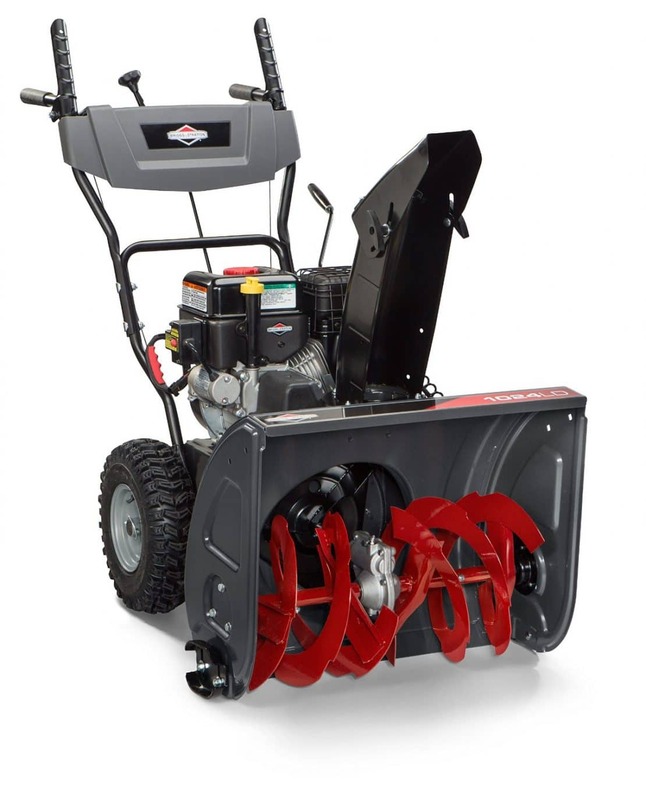 Hi Patrick, Yes, the Briggs & Stratton 1696614 Dual-Stage Snow Thrower with 208cc Engine and Electric Start, 24″ (Amazon link) is a good choice for gravel. You can adjust the skid shoes so you don’t pick up much gravel when You are clearing your drive. I live in Central WI. I am looking at a used Briggs & Stratton snowblower for sale at $750. It has about 10 hours use according to owner who is elderly with a very small driveway and no longer needs it. He purchased new in 2014. It is a 28 inch dual stage 1528HD, 305 cc 14.5TP. It has power steering and power chute control, cab is included. It is wired for but does not have hand warmer. Model #1696157-00 with model year 2012. Engine model is 20M314, type 0135F1. This is less than half the price of a new Ariens 28 inch Deluxe SHO which I was considering. Honestly, I never hear B&S snowblower before. Owned Ariens 8524 for past 15 years. What are your thoughts on this B&S. Hi Paul, Briggs & Stratton owns both Simplicity and Snapper. They are painting those snow blowers gray and rebadging them as Briggs. You’ll also find them as Brute at Menards and few other retailers. That snowblower sold for about $950-1150 new. As a Simplicity that model has been around for a long time. It’s not the Ariens Deluxe SHO in capacity or build quality but’s it’s “good enough” for our Wisconsin winters. Hello, I’ve really been enjoying your website, lots of great info. However I’m still torn as what blower is the best for the bucks. We want a medium to heavy use, in the range of a 26-30″. I’ve been tossing around a few makes, ariens deluxe 28″ for about 1700$, a toro 26 oxe for 1700 and a Briggs and Stratton 30″ for 1550$. What is the best bange for quality and reliability? Thanks! Hi Jana, Are you in Canada? I’m guessing based on the prices. I strongly suggest the Toro or the Ariens you mentioned. Both are good units that will last you a long time and they are very comparable in features and capacity. The Toro is slightly easier to use with the Quick-Cute controls and the Ariens has larger wheels so it will be slightly better for “off-road” use. I suggest going to each dealer and then pick the snow blower based on which dealer you like best. Hi Nick, I asked at the Briggs both at the GIE-EXPO last week and they stated it’s a sleeve bearing. I have a Ariens snow blower with the Briggs and Stratton Snow Series engine. I drove 6 hours to buy it because it was the last one of that model that came with the Briggs and Statton engine. What a mistake that was! I would have been better off with ones that come with the Chinese engine rather than rattling piece of junk. I have 38 hours on it and a lot of that time is idling time after valve adjustments. I get maybe 5 to 6 hours before the valves need adjusting. I have reached out to B&S and only got BS from them. After having this troublesome engine and the total lack of any type of support from Briggs and Stratton, I can say I WILL NEVER BUY ANYTHING WITH THEIR ENGINE ON IT EVER AGAIN! Hi Gary, I’m not going to make any excuses for the brands here but I would like to address your service issue so that others who read this comment will have better luck in the future. 1. Companies like B&S make and sell millions of engines a year. They come in all shapes, sizes and quality levels. 2. The best place to get repair, parts and warranty work is your local authorized dealer. Preferably the dealer you bought it from or in the case of Lowes/Home Depot a dealer authorized to work on that stores products. In your case you bought the snow blower miles away so you would need to get that dealer to find you a local dealer to work with. 3. Companies like B&S have a hard time dealing with individuals because even if they have less than a half of a percent failure rate for the engines – that 100’s of phone calls a day. Plus having years and years of these engines out there running, parts, troubleshooting, etc. could mean 100’s of thousands of calls a day. So, it’s not practical for them to have a full, expert dealer network and another group of experts sitting in some call center taking care of each problem by phone. That is why when you do get a hold of most of these corporations one of the first questions they ask is if you have brought it to your dealer. 4. So, If you are having problems with a unit find the phone number listed in your operator’s manual. They will help you find the correct warranty repair, service and parts. By the way, bent valves have always been a problem on most snow engines. That’s why today most do not have a throttle. Run it at working speed and turn it off when you are not using it. B&S a primary player? Under Simplicity they had decent stuff. Under Murray? It’s crap. So is the B&S branded stuff. You need to do your homework before you start telling others how to buy. Unless you are in it to just make a buck. Then your view point is understood. And, shame on you. Hi Jack, Thanks for your comment. Just remember I’m here not to tell you what is the best snow blower. I’m here to find the best snow blower for you! 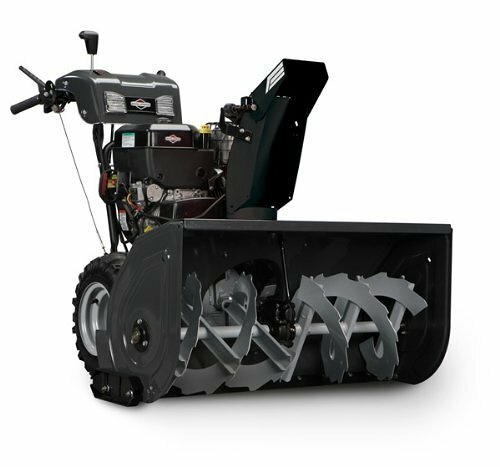 Like MTD, B&S makes a complete line of snow blowers and they range from some of the cheapest on the market to some of the most expensive. They range from some of the least reliable to the most reliable. They have their place and in some areas of the country are more popular than any other brand. By the way I have a Murray snow blower sitting here that is 26 years old. It sets outside all the time and I can go out right now and start it and use it to clean my drive. It’s not the fastest but It has never needed a part other than a skid shoe in those 26 years. Are they the best? Are they the worst? Well they have a better service network than any of the Chinese imports. The HD models have been around for years and many are still running strong. Using the criteria Consumer Reports uses they are right in the middle of their ratings. I get comments like the one you posted on every brand and model snow blower. It doesn’t matter if it’s Ariens, Troy-Bilt, Honda, Cub Cadet, Toro, Craftsman, Simplicity, B&S, there some owners who love their machine and others who want a “class action lawsuit” because it doesn’t work for them. I know there are many different snow blowers and there is one out there that has the right combination of service, reputation, color, features and price for everyone including you. My job is to match those features with your needs. We live in Morris County, New Jersey, and typically have 6-8 storms per year; however, some years harsher than others. However, my husband does do 5 driveways at a time (not too big) because we have many senior citizen neighbors. The last one he had (MTD or MDT?) lasted 20 years, but needs a new one. I was thinking of Briggs 1696614? Thoughts or suggestions? That is based on what we can afford and what was rated well. Hi Michelle, My first choice is the Toro Snow Master 724 QXE. It has proven to be really fast to use and does a good job on your typical snows. In fact, I sold a lot of them out on Long Island this fall and they say it’s doing a wonderful job on the 18 inch snow they got. The only thing that may switch you back to a true 2-stage is it’s designed for hard surfaces. It doesn’t work that well for gravel driveways. It’s a $100 less than the Briggs and twice as fast. If you want a 2-stage write back and I’ll give you a better choice than the Briggs. 1. 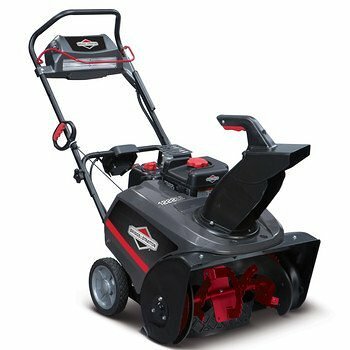 Briggs and Stratton 1696610 Dual-Stage Snow Thrower with 208cc Engine and Electric Start . This model is the lightweight version. It is comparable to the Cub Cadet. 2. 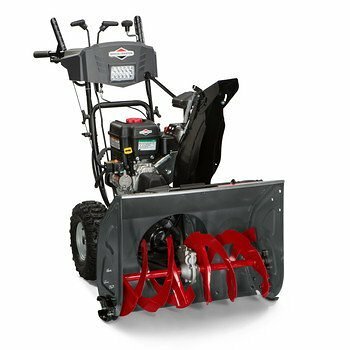 Briggs and Stratton 1696614 Dual-Stage Snow Thrower with 208cc Engine and Electric Start . This is the medium duty version. It is more comparable to the Toro 826 but I do feel the Toro will throw farther. This model has been around as a Simplicity for quite some time. Is it a decent residential snow blower. It will handle your driveway and snowfall well. I don’t talk too much about Simplicity for the only reason that they only have about 3% of the market and they did not promote the snow blowers much from 2008 to 2014. We were not sure if Briggs was even going to keep making snow blowers for a while. But in 2014 Briggs took all the production lines and moved them under one roof. Now they are promoting them more.